Racin’ Today » The Teen Beat At Haas F1 Team Goes On. The Teen Beat At Haas F1 Team Goes On. 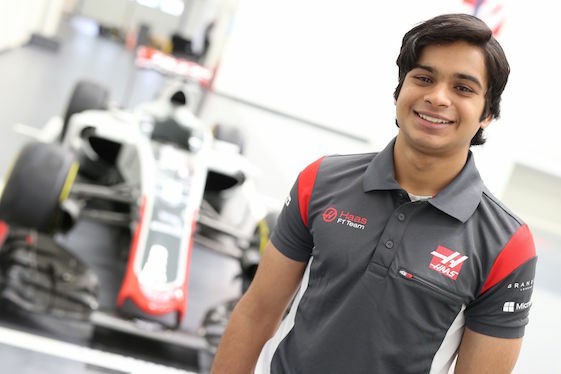 Teen-ager Arjun Maini has been added to the Haas F1 driver development program. Haas F1 Team has expanded its “kiddie corps” driver development program, pairing Indian teenager Arjun Maini alongside fellow-teen Santino Ferrucci of the United States. Maini, 19, is competing in the GP3 Series for Jenzer Motorsport after running 14 of 18 GP3 Series races in 2016. Despite missing the first four races, Maini finished 10th in the championship standings with a best finish of second, earned July 23 at the Hungaroring in Budapest. The announcement was made Thursday at Circuit de Barcelona – Catalunya, site of this weekend’s Spanish Grand Prix. Like the 18-year-old Ferrucci, Maini will be embedded with Haas F1 Team at every opportunity, attending races and tests throughout the year while also participating in the team’s simulator program. Maini earned his first title in 2007 when he won the Rotax Mini Max National Championship. Numerous wins and podiums followed before Maini began the transition to open-wheel. He won the 2013 Formula BMW Super Six Series in Asia and finished second overall in the 2014 BRDC Formula 4 championship with four wins, 10 podiums, five poles and six fastest laps. In 2015, Maini competed in the Toyota Racing Series New Zealand and finished fourth in the standings with two wins, five podiums, three poles and two fastest laps _ a performance that led him to GP3 in 2016. Haas F1 Team made its debut in 2016, becoming the first American F1 organization in 30 years. Now in its second season, the organization founded by American businessman Gene Haas is looking to build upon its impressive first year, when it finished eighth in the constructors standings with 29 points. The GP3 Series runs in conjunction with the FIA Formula One World Championship this weekend at Circuit de Barcelona – Catalunya; July 7-9 at the Red Bull Ring in Spielberg, Austria; July 14-16 at Silverstone Circuit in England; July 28-30 at the Hungaroring; Aug. 25-27 at Circuit de Spa-Francorchamps in Belgium; Sept. 1-3 at Autodromo Nazionale Monza in Italy and Nov. 24-26 at Yas Marina Circuit in Abu Dhabi, UAE. The only non-companion race weekend is the penultimate round, Oct. 6-8 at Circuito de Jerez in Spain. Ferrucci’s return as development driver, while simultaneously competing in his second fulltime season in the GP3 Series for DAMS, was announced Tuesday. A native of Woodbury, Conn., Ferrucci joined Haas F1 Team last year and participated in a two-day test with the Kannapolis, N.C.-based organization July 12-13 at Silverstone Circuit in England. By piloting the Ferrari-powered Haas VF-16, Ferrucci became the first American driver to wheel an American Formula One car since Oct. 9, 1977. That was when Danny Ongais, a native of Hawaii, drove a Penske PC4 in the Canadian Grand Prix at Mosport International Raceway in Bowmanville, Ontario, Canada. DAMS is an accomplished team that has helped graduate numerous drivers into the F1 World Championship, including Haas F1’s current lineup of Romain Grosjean and Kevin Magnussen. Frenchman Grosjean earned three championships with DAMS _ the 2010 Auto GP title, the 2011 GP2 Asia Series crown and the 2011 GP2 Series championship. Magnussen, of Denmark, won the 2013 Formula Renault 3.5 Series championship with DAMS. Ferrucci is back with DAMS for his sophomore year in GP3. Ferrucci began his career in karting. At age 5, he was touring the USA and Europe and by the time he was 11, Ferrucci was a multi-time champion. In 2013, Ferrucci graduated to open-wheel racing, competing in Formula 2000 and the Skip Barber Racing Series. Ferrucci won his Skip Barber Racing Series debut at Homestead-Miami Speedway and collected five victories, two poles and three fastest-lap awards. In Formula 2000, Ferrucci never finished outside of the top-four in the six races he started, with each field featuring 37 or more cars. The 2014 season saw Ferrucci drive in British Formula 3. He won two races, both at Brands Hatch in England, becoming the youngest race-winner in the history of British Formula 3 at 16 years, 2 months and 30 days. In 2015, Ferrucci continued to advance in open-wheel, competing in the Toyota Racing Series New Zealand and the FIA Formula 3 European Championship. Ferrucci finished third in the Toyota Racing Series New Zealand point standings on the strength of one win and five podiums. It was his first full season competing in an open-wheel championship. Ferrucci’s ascension up the ranks continued in 2016 in his first season with DAMS, highlighted by a third-place finish Aug. 27 at Spa-Francorchamps. He also made his sports car debut, winning his first outing in the Lamborghini Blancpain Super Trofeo North America race Sept. 15 at Circuit of The Americas in Austin, Texas. As was the case during its inaugural season, Haas F1 Team is a technical partner with Scuderia Ferrari, F1’s oldest and most glamorous organization. That arrangement with the factory in Maranello, Italy, includes the power unit, gearbox and mechanical components such as suspension and brake systems on the second generation VF-17. Haas F1 Team is based at the same North Carolina campus as his championship-winning NASCAR Cup Series organization, Stewart-Haas Racing. The chairman of Haas F1 Team, Haas also is the founder of Haas Automation, largest CNC machine tool-builder in North America.